The hCMV promoter is very commonly used for high level expression of transgenes in mammalian cells, but its utility is hindered by transcriptional silencing. Large genomic fragments incorporating the CpG island region of the HNRPA2B1 locus are resistant to transcriptional silencing. In this report we describe studies on the use of a novel series of vectors combining the HNRPA2B1 CpG island with the hCMV promoter for expression of transgenes in CHO-K1 cells. We show that the CpG island gives at least twenty-fold increases in the levels of EGFP and EPO observed in pools of transfectants, and that transgene expression levels remain high in such pools for more than 100 generations. These novel vectors also allow facile isolation of clonal CHO-K1 cell lines showing stable, high-level transgene expression. Vectors incorporating the hnRPA2B1 CpG island give major benefits in transgene expression from the hCMV promoter, including substantial improvements in the level and stability of expression. The utility of these vectors for the improved production of recombinant proteins in CHO cells has been demonstrated. Despite recent progress in elucidating the molecular basis of gene expression the practicality of achieving reliable, stable, high-level transgene expression in mammalian cells remains a major challenge. This inefficiency of transgene expression is largely attributable to transcriptional silencing, which typically involves methylation at CpG DNA sequences, histone deacetylation and chromatin condensation in the vicinity of the integration site [1, 2]. When exogenous genes are introduced into cultured cells, many of the integration events lead to rapid transgene silencing, whilst the remainder give widely varying expression levels [3, 4]. For this reason the use of cultured mammalian cells to produce recombinant proteins (except at very small scale) usually requires labour-intensive isolation of rare, clonal cell lines that stably express the transgene at high levels. Similarly, chromatin structure-related silencing and extreme variability in expression hinder the use of transgenic animals for purposes such as defining novel gene function and manufacture of therapeutic proteins [5, 6]. Furthermore, achieving clinical utility with gene therapies (especially for chronic diseases), is greatly hindered by inadequate levels and duration of therapeutic transgene expression, resulting partly from transcriptional silencing [7, 8]. The identification of elements capable of maintaining a transcriptionally competent ("open") chromatin domain resistant to silencing, irrespective of tissue type or integration site, is therefore an important objective in the development of technology giving more efficient transgene expression in mammalian cells, for many important applications. We have reported previously that large DNA fragments containing CpG islands from the human TBP-PSMB1 and HNRPA2B1-CBX3 loci (designated TBP and RNP below) are resistant to heterochromatin-mediated silencing of these genes . These regions are structurally similar, containing dual divergently transcribed promoters embedded within an extended methylation-free CpG island. The divergent promoters drive expression of ubiquitously expressed housekeeping genes, encoding the TATA binding protein and proteasome component-B1 in the case of the TBP locus, and the heterogeneous ribonucleoprotein A2/B1 and chromobox homolog 3 in the case of the RNP locus. Our previous studies showed that with these large CpG island-containing fragments, active transcription from the endogenous promoters was maintained even upon integration into centromeric heterochromatin, that single copy integration at different sites gave very similar levels of gene expression, and that position effect variegation was greatly reduced . The endogenous promoters of the housekeeping genes at the TBP and RNP loci are relatively weak. In this paper we report studies with a series of novel expression vectors in which the CpG island from the RNP locus was combined with the immediate early promoter/enhancer of the human cytomegalovirus (hCMV), the promoter most commonly used to achieve strong, non-selective expression in mammalian cells for many applications. We show that the RNP CpG island confers major benefits in transgene expression from this promoter, including substantial improvements in the level of expression and proportion of transfected cells that express at detectable levels. We show that with these novel vectors expression remains high on prolonged subculturing. We also demonstrate the utility of these vectors for the improved production of recombinant proteins in Chinese Hamster Ovary (CHO) cells. Our previous report concerned the ability of large DNA fragments containing the RNP CpG island to inhibit transcriptional silencing of genes expressed from the promoters of the endogenous housekeeping genes . With a view to developing vectors allowing facile generation of constructs for improved, high-level transgene expression, we first evaluated smaller fragments containing this CpG island. As shown in Figure 1A the HNRPA2B1 and CBX3 genes are divergently transcribed from two separate promoters embedded within a methylation-free CpG island approximately 3 kb in length . We evaluated three CpG island-containing fragments of length 8.0 kb, 4.0 kb and 1.5 kb (Figure 1B). All three fragments contained the dual divergent promoters. The 8.0 kb and 4.0 kb fragments both contained the entire methylation-free CpG island, while the 1.5 kb fragment contained approximately half of this region. These fragments were incorporated into vectors for expression of EGFP from the hCMV promoter as indicated in Figure 1B. The human HNRPA2B1/CBX3 (RNP) locus and constructs used in EGFP and EPO expression studies. A. Organisation of the RNP genomic locus. The figure indicates the locations of the divergent promoters (arrows), the exons (black boxes) and the 8.0 kb Hind III fragment that includes the 3 kb unmethylated CpG island. B. EGFP and EPO expression constructs. All constructs carried the Neor gene preceded by the SV40 promoter for selection of stable transfectants of CHO-K1 cells. Following stable transfection of these constructs into CHO-K1 cells, EGFP expression was quantified by FACScan analysis of transfectant pools after 33 and 200 generations of culture (Figure 2). 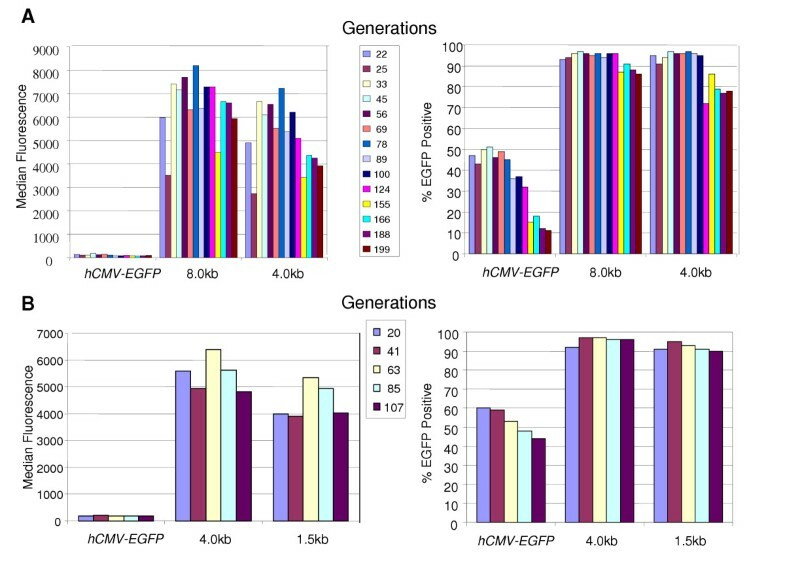 After 33 generations pools derived with hCMV-EGFP showed a characteristically wide range of expression levels, manifest as a broad plateau rather than a discreet peak of EGFP expressing cells. Interestingly, 48% of the cells showed no detectable expression and only 6% of the cells showed expression exceeding 1000 fluorescence units at this stage of culture. By contrast, after 33 generations of culture for the 8.0 and 4.0 kb RNP-EGFP containing populations only 3% and 5% of the cells respectively showed no detectable expression, with 88% and 84% of the cells respectively showing median expression exceeding 1000 fluorescence units. The majority of cells in these populations showed very high expression levels, as evidenced by the steep shoulder at the end of the detectable range. Similarly, after 200 generations of culture these stably transfected cell populations contained 75% and 73% of cells with median fluorescence exceeding 1000 units. At the same stage of culture only 2% of cells in the pool transfected with hCMV-EGFP showed fluorescence exceeding 1000 units. FACScan analysis of EGFP expressing CHO-K1 cells. Following stable transfection with hCMV-EGFP, 8.0 kb RNP-EGFP, or 4.0 kb RNP-EGFP, pools of >100 transfectants were cultured continuously with drug selection for 200 generations, and FACScan analysis conducted after 33 and 200 generations. The results are plotted as green fluorescence on a logarithmic scale (FL1-H) versus number of events on a linear scale (counts). Figures for gate M1 are % cells with undetectable fluorescence; those for gate M2 are % cells showing greater than 1000 fluorescence units. Figure 3 (A and B) shows the results (in histogram format) of similar experiments, conducted over 199 or 107 generations of culture, with vectors containing the 8.0, 4.0 and 1.5 kb CpG islands. The 1.5 kb RNP CpG island fragment conferred improvements in level of expression from the hCMV promoter and percentage of cells showing detectable EGFP expression that were very similar to those observed for the larger fragments. FACScan analysis also showed the characteristic steep shoulder associated with the larger RNP fragments (data not shown). Overall, the 8.0, 4.0 and 1.5 kb RNP fragments reproducibly gave 20- to 40-fold increases in the median expression levels of EGFP compared to that observed for the hCMV promoter alone, and these increased levels were maintained through at least 107 generations of continuous culture. The effects of the CpG island fragments on EGFP expression level and stability were further studied using clonal CHO-K1 cell lines rather than transfected pools. Figure 4A shows the results of quantifying EGFP expression for clones isolated following stable transfection with the hCMV-EGFP and 8.0 kb RNP-EGFP vectors. Of more than a hundred clonal lines containing the hCMV-EGFP construct the majority (60 of 112) showed no detectable EGFP expression, with only a single clone displaying a median expression level that exceeded 5000 fluorescence units. In contrast, for clones generated with the 8.0 kb RNP-EGFP construct, the great majority (74 of 86) did show detectable EGFP expression and a large proportion (63 of 86) had a median expression level exceeding 5000 units. 41 of 86 clones with the 8.0 kb RNP-EGFP construct showed expression exceeding that of the best hCMV-EGFP clone. Of the 12 clones generated with this construct that showed no detectable EGFP expression, all those examined by Southern blot analysis proved to have deletions extending (at least) into the RNP sequences (data not shown). These deletions presumably occurred prior to or during the integration process. Similar analysis of non-expressing clones generated with the hCMV-EGFP construct revealed many with no detectable deletion. These results suggest that the 8.0 kb RNP fragment confers a substantial increase in the proportion of integration events that lead to detectable gene expression. The 8.0 kb RNP CpG island fragment gives a high proportion of clonal CHO-K1 cell lines showing high-level, stable expression of EGFP. Following stable transfection of CHO-K1 cells clonal lines were derived by limiting dilution. Median fluorescence levels were measured for each clone by FACScan analysis after 22 generations of culturing with drug selection. A. Histograms representing the median fluorescence levels for clones generated with hCMV-EGFP (n = 112) and 8.0 kb RNP-EGFP (n = 86). B. FACscan analysis of two clonal lines described in A. Clonal cell lines were subcultured continuously with or without drug selection for a further 213 generations, with analysis after 38 and 213 generations. Figures for gate M1 are % cells showing greater than 1000 fluorescence units. Ideally, for large-scale manufacture of protein therapeutics clonal cell lines producing the proteins are expanded without drug selection from a master cell bank. Where proteins are manufactured for use in humans the regulatory authorities require evidence that the manufacturing process gives production that is stable (i.e that falls within defined specification limits) over 25 to 30 generations of culture. 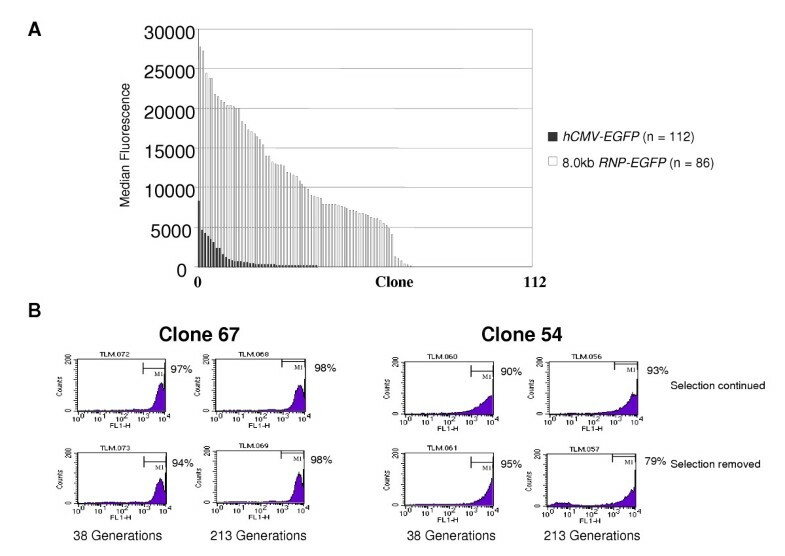 To investigate the suitability of vectors containing the RNP CpG island fragments for this purpose, four clonal lines generated with the 8.0 kb RNP-EGFP construct and showing median expression that exceeded 5000 fluorescence units after 118 generations of culture in the presence of G418, were cultured with and without drug selection for a further 213 generations. For all four clones no reduction was observed in the percentage of cells showing expression exceeding 1000 fluorescence units after 213 generations of culture with drug selection. Also for all four clones no reduction was observed in the percentage of such cells after 38 generations without drug selection. Slight instability of expression was observed for one clone, #54, on very prolonged culture without drug selection. As shown in Figure 4B for this clone the percentage of cells showing expression exceeding 1000 units declined from 95% to 79% between 38 and 213 generations, while for the other three clones, exemplified by #67, no such decline was observed. The utility of the RNP CpG island vectors for recombinant protein production was further examined using the erythropoietin (EPO) gene. Constructs were generated with the EPO cDNA sequence under the control of either the hCMV promoter alone or in combination with the 8.0 kb RNP fragment (Figure 1B). Following stable transfection into CHO-K1 cells EPO production was measured for pools of transfectants over 174 generations of culture (Figure 5A). The 8.0 kb RNP-EPO construct gave a substantially higher yield of EPO at all time points than that observed with hCMV-EPO. On average the RNP CpG island vector gave a twenty-fold improved yield of EPO, and the improved production was maintained through at least 100 generations of subculture. The 8.0 kb RNP fragment increases the yield of EPO in stably transfected CHO-K1 cells. A EPO production from pools of CHO-K1 cells stably transfected with hCMV-EPO or 8.0 kb RNP-EPO. Following selection on G418 pools of transfectants were cultured continuously with drug selection for 174 generations. Assays for EPO production were conducted every few days. B EPO production from clonal CHO-K1 cell lines derived with hCMV-EPO or 8.0 kb RNP-EPO. Clonal lines were derived by limiting dilution from pools of transfectants selected on G418. Colonies were expanded for 35 generations with drug selection prior to assay for EPO production. Clonal CHO-K1 lines were derived from transfectants generated with the hCMV-EPO and 8.0 kb RNP-EPO expression constructs. Twenty clones were chosen at random and assessed for EPO production (Figure 5B). For clones derived with hCMV-EPO, 6/20 produced no detectable EPO and only 1/20 (C4) showed a yield (0.85 μg/ml) exceeding 0.5 μg/ml. In marked contrast, 20/20 clones harbouring 8.0 kb RNP-EPO showed detectable EPO production, 18/20 produced more than 0.5 μg/ml, 16/20 produced more than 1 μg/ml, and one clone (R16) produced almost 14 μg/ml. 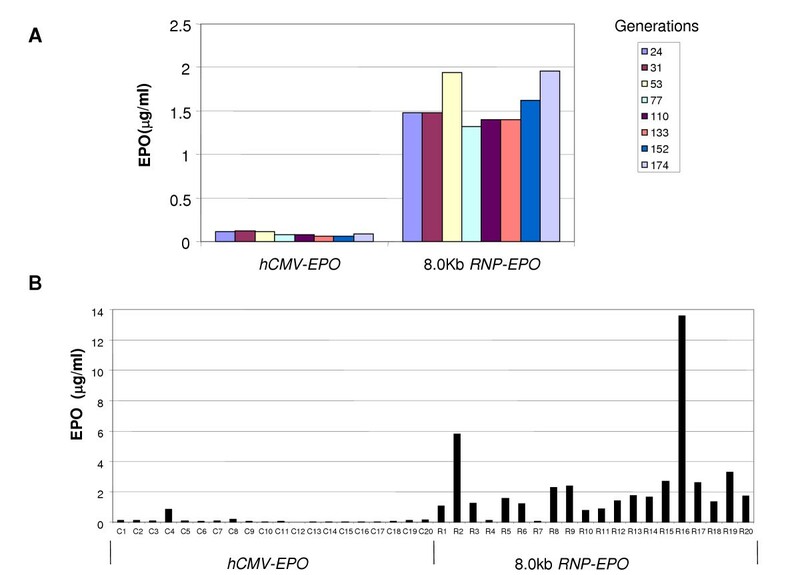 Thus inclusion of the 8.0 kb RNP fragment in the expression construct resulted in the facile isolation of clones with improved EPO production, the average yield for the twenty clones being twenty-one-fold higher than with hCMV-EPO, and the best producing clone with 8.0 kb RNP-EPO giving sixteen-fold higher productivity than C4, the highest producing hCMV-EPO line. The possibility that CpG island vectors give improved transgene expression through integration at increased copy number was evaluated by conducting copy number analysis on genomic DNA for clonal lines expressing EGFP following transfection with hCMV-EGFP (13 lines) or 8.0 kb RNP-EGFP (9 lines). All these lines proved to have copy numbers of two or three. The highest expressing clones with both constructs had a copy number of three, but so did some of the lowest expressing clones for both constructs. Overall, statistical analysis of variance (by the ANOVA single factor method) indicated no significant correlation between level of expression and copy number for either construct. The hCMV promoter has been by far the most commonly used promoter for high level transgene expression in mammalian cells, for a wide range of applications that includes the production of protein therapeutics in cultured cells, transgenic animals and gene therapies. Its utility in expressing transgenes for all these applications, however, has been hindered by its susceptibility to silencing, largely through effects involving adverse chromatin structure. For example, the isolation of clonal cell lines or transgenic animals showing stable, high level expression of transgenes is usually a slow and labour-intensive procedure because most integration events lead to silencing. The results we report here show that incorporating a RNP CpG island fragment immediately upstream of the hCMV promoter gives major benefits in expression from the latter. These benefits include a substantial increase in the median level of expression observed in pools of transfectants, together with a substantial improvement in the proportion of cells in the pool that express. The CpG island fragments reproducibly gave 20 to 40-fold increases in the level of expression observed. With both EGFP and EPO these dramatically increased expression levels were maintained through at least 100 generations of subculture. The CpG island fragments also enabled the rapid and facile isolation of clonal cell lines showing stable, high level expression of EGFP and EPO. Our previous work  showed that a 16 kb DNA fragment containing the RNP CpG island conferred resistance to heterochromatin-mediated silencing of expression from the endogenous RNP promoter and reduced position effect variegation, giving very consistent expression levels in tissue culture cells. In the studies we report here, constructs with the 8.0 kb RNP CpG island fragment preceding the hCMV promoter gave detectable levels of transgene expression for all integration events in which the construct remained intact, together with substantial increases in the level of expression from the hCMV promoter. Analysis of variance (by the single factor ANOVA method) showed these increases to be statistically significant (p = 8.13E-27). These constructs, however, gave much greater variability in levels of expression than those observed in our previous work with a larger CpG island fragment and the endogenous RNP promoter. It is not clear whether the greater variability in expression level for the CpG island constructs in the studies we report here than our previous ones is due to the use of a different promoter or different cell line, or occurs because sequences giving more complete isolation from the effects of chromatin structure or transcriptional activity adjacent to the integration site are present on the 16 kb fragment but not on the 8 kb fragment. The present results demonstrate two very important applications of this novel transgene expression technology. One is the rapid production of recombinant proteins, in the quantities required for basic research, drug discovery and preclinical studies, using stable pools of transfectants. The CpG island technology circumvents the need for slow, labour intensive screening of clonal lines for this purpose. The other is faster and easier identification of clonal cell lines that show stable, high level production as candidates for large scale manufacture of protein therapeutics. With the CpG island technology screening of only 20 clonal CHO cell lines was sufficient to identify lines showing very high yields of EPO, the latter being a blockbuster protein drug that is widely used to treat anaemia associated with renal failure and chemotherapy. It is noteworthy that the hCMV and CHO cells used in these experiments are the promoter and cells most commonly used for commercial manufacture of protein therapeutics. Through their capacity to confer an increase in the proportion of integration events that are productive, together with improvements in the level of transgene expression, RNP CpG island vectors have many other potential applications, including use in mammalian cell-based in vitro screens for drug discovery, transgenic animals for basic research and drug discovery, and gene therapy. For some of these applications, notably those involving transgene delivery with integrating viral vectors, gene expression elements of small size are required. The data we present here suggest that the 1.5 kb RNP fragment confers major benefits in expression level from the hCMV promoter. Efforts to further characterise and minimise these elements are ongoing, but the 1.5 kb fragment should be small enough for incorporation into most viral vectors. The mechanism by which the RNP CpG island reduces silencing and improves transgene expression is under investigation in our laboratories. The data we report here show that the mechanism does not involve increasing the copy number of the integrated transgene. Our results to date, reported previously  and in this paper, are consistent with these elements being able to establish and maintain a more open chromatin domain irrespective of the local chromosome environment. We propose that the promoter-containing CpG-islands of housekeeping genes possess a chromatin remodelling function and that this is designated a "Ubiquitously-acting Chromatin Opening Element", or "UCOE". hCMV-EGFP was vector pEGFP-N1 (Clontech, Cambridge, UK), which contains the hCMV promoter/enhancer on a 589 bp fragment. 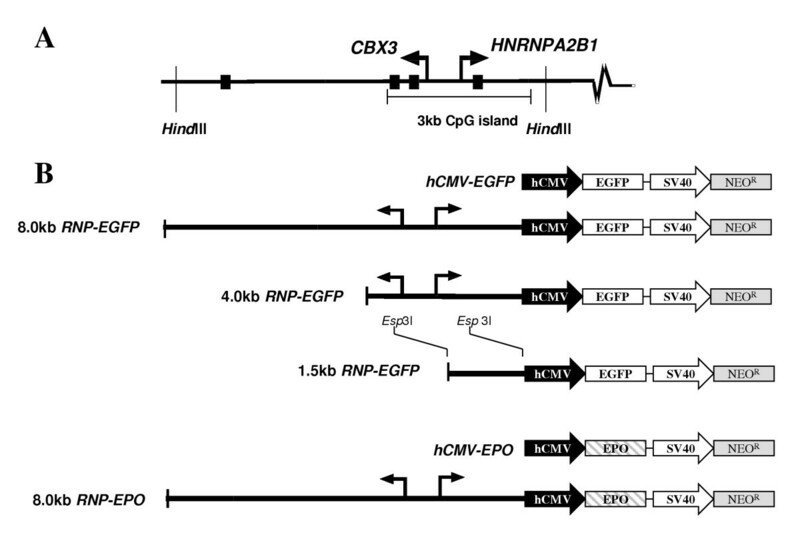 RNP CpG island-containing vectors were constructed by inserting genomic fragments from the RNP locus into the blunted Ase I site of hCMV-EGFP. These fragments were blunted versions of the 8.0 kb Hind III fragment, 4.0 kb BamH I-Hind III fragment and 1.5 kb Esp3I fragments to give 8.0 kb RNP-EGFP, 4.0 kb RNP-EGFP and 1.5 kb RNP-EGFP respectively (Figure 1B). The erythropoietin (EPO) cDNA was isolated by PCR amplification from a Quick Clone Foetal Liver cDNA library (Clontech, Cambridge, UK). The resulting 705 bp product was subcloned using the TA-cloning vector pCR3.1 (Invitrogen, Paisley, UK) generating pCR-EPO. hCMV-EPO was constructed by subcloning an NheI-NotI fragment from pCR-EPO into the respective sites within the vector pEGFP-NI. 8.0 kb RNP-EPO was constructed by subcloning the blunt-ended 8.0 kb Hind III fragment into the blunted Ase I site of hCMV-EPO (Figure 1B). CHO-K1 cells were grown in HAMS F12 (Invitrogen, Paisley, UK) plus 4500 mg/l L-ananyl-L-glutamine, 10 μg/ml each of penicillin and streptomycin, and 10% (v/v) heat inactivated foetal calf serum (FCS; Invitrogen, Paisley, UK). Transfection was carried out by electroporation using approximately 107 cells from 80% confluent cultures and a BioRad Gene Pulser II ™ set to deliver a single pulse of 975 μF at 250 V. Transfections used 1 μg of linearised hCMV plasmid and equivalent molar quantities for expression vectors of different size. Stably transfected cells were selected and maintained in growth medium containing 400 μg/ml geneticin sulphate (G418; Sigma, Poole, UK). Clonal cell lines were derived from stable transfected pools by standard limiting dilution techniques. Copy number was determined by quantitative PCR (QPCR) using oligonucleotide primers and Beacon probes designed using Beacon Designer v2.0 software (Premier Biosoft International, CA, USA) specific to hCMV or EGFP sequences and to the endogenous housekeeping gene β-actin as a copy number control. Multiplex QPCR reactions containing optimised oligonucleotide and probe concentrations and ~500 ng of template DNA were performed on the MX4000™ multiplex PCR quantitative PCR system according to the manufacturers protocol (Stragene, La Jolla, CA), and subsequent data manipulations performed using the MX4000™ analysis software (Stratagene, La Jolla, CA). Copy number was assigned by comparison of the hCMV and/or EGFP: β-actin endpoint fluorescence ratio with that of a verified single copy integrant. This work was partially funded under the UK Department of Trade and Industry LINK programme with support from the Medical Research Council and Biotechnology and Biological Sciences Research Council. SW carried out vector construction, EGFP pool transfection and analysis and experimental design. TM and TM participated in vector construction, CHO-KI transfection, EGFP pool and clonal analysis. MG carried out EPO cloning, CHO-KI pool and clonal analysis. DS carried out copy number analysis and manuscript preparation. MA was the original investigator and participated in the conception of the study. AI participated in coordination of the project and manuscript preparation. AM and RC were involved in the conception, experimental design and manuscript preparation.